The drumbeat continues to sound for the preservation of obsolete and endangered moving image formats, particularly videotape. 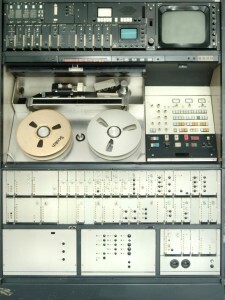 As older tape formats become unplayable, either through decay or lack of equipment to play them back, the urgency grows to find ways to preserve their content using modern digital formats. The problem has been considered by multiple organizations acting separately over the past decade, and all of them have wrangled over the same question: What digital format should be used to preserve this content in the digital space, and help ensure that we aren’t finding ourselves in the same obsolescence predicament right away? Interestingly, those analyzing this problem and making decisions for their respective organizations have often come up with different answers. Those differing opinions, and the rationale behind them, were the subject of a talk held earlier this month in Philadelphia, at the Association of Moving Image Archivists / International Association of Sound and Audiovisual Archives (AMIA/IASA) 2010 Conference. Representatives from the respective digital preservation projects underway at the Library of Congress, Rutgers University Libraries, and Stanford University were each on hand to offer their perspectives and the paths their organizations took for digitally preserving their video. I feel an important conclusion to take away from this talk is that there isn’t always a single right answer to the digital preservation conundrum. There is a common desire among preservationists to have and use a widely accepted standard format for keeping our digital objects safe in the long term. However, while formats and standards can be recommended and can work very well for a wide variety of use cases, there are always those local requirements and special needs that need to be considered, and adjustments made accordingly. Fortunately, a great deal of progress has been made in the last several years, as those who were once wading into this problem alone have experimented and learned from past mistakes. It’s venues like this which permit that knowledge and experience to be shared, so that those preservationists just starting to consider the problem can use that wisdom, and have multiple case studies to consider in making decisions of their own.